Today I have a brand new make-ahead paleo egg muffin recipe! This one is loaded with sausage and broccoli and will totally fuel you until lunch! 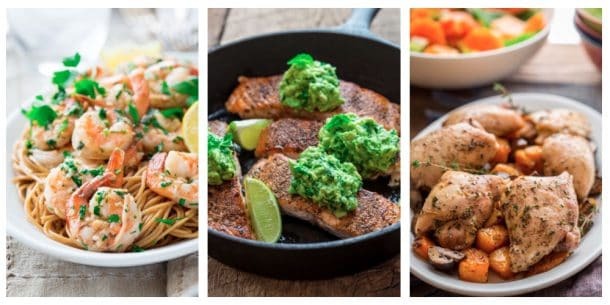 A serving will give you 18 grams of protein! They are like a portable little omelet made in a muffin tin! Hello middle of January! Let’s catch up! How are your healthy eating habits sticking? Are you happy to be making positive changes? Please let me know by leaving a comment below. Honestly, I want to hear from you. What’s working, what isn’t? Jase and I have been doing a paleo diet for the month, and we both feel amazing. He is melting weight off, and my belly is feeling so much better. I have to say, this month’s paleo challenge has been a real eye opener for me for many reasons. One of which is the fact that I don’t think I had any clue how much dairy I was eating! Like every day, several times a day. Not that it’s a bad thing, but if that is in fact one of the culprits as to why I am having issues with IBS and GERD, then I am pretty much kicking myself about the fact that I have been giving myself a steady stream of it as long as I can remember. 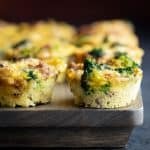 Take these high-protein Egg Muffins for example, normally I would have topped them with a nice big pinch of shredded Vermont cheddar to seal the deal. Like I did for these Veggie Egg Cups. But being on this challenge, I had to find alternate ways of making them super delicious. Read more on that below! Time will tell about if I’ll need to keep away from dairy or not moving forward. I will be adding in each food, one at a time, that I removed after January, and we’ll see what the triggers are for my symptoms to come back. Very scientific, no? In other news, after taking two months off from doing our usual Thursday photo shoots in my photo studio, now Stephanie and I are back in the swing of things, working together to make pretty pictures for my freelance clients. This week, I will try to remember to share some behind the scenes on my instagram stories. Anywhoo, let’s talk some more about these amazing low-carb egg muffins with sausage and broccoli! To make these muffin tin egg muffins more satisfying without cheese (so they could be dairy-free) I added sausage to them. Sausage is something we enjoy in moderation around here. Usually we have it as an supporting role ingredient in something else, like soup or stuffing. When considering it as a protein source, sausage is really high in calories and saturated fat, about 270 calories per serving. Compare that to boneless skinless chicken breast at 140 calories per serving. It does have a lot of great flavor, and the richness of it does help with satiety. That’s why it is a good option for a paleo breakfast. Two of these have enough calories (290), fat (23 g)and protein (18g) to keep me full all morning long. Without the sausage, I would’ve needed to add something else to my breakfast to make it more caloric. I am also really trying to get in either fruit or vegetables at breakfast. This is something, prior to eating paleo I wasn’t in the habit of doing. Adding in 2 cups of broccoli to this recipe gives me a modest amount of healthy veggies per serving of two egg muffins. When you take cheese out of a recipe, you can loose that satisfying cheese flavor that we all love so much, so I made sure to amp up the flavor a little bit. I added in a teaspoon of Dijon mustard, salt and pepper. And on top I sprinkled on some paprika. It doesn’t add much in the flavor department, but I think it makes them look prettier. If you like, you could also add in a pinch of garlic powder. But I find that the sausage adds plenty of additional flavors. If you are doing the Whole30 challenge or you follow a paleo lifestyle, then you already know to read the labels of the ingredients you use. Check to make sure your sausage and Dijon are sugar free. If you are Whole30 you’ll also want to check for nitrates too. A few things I have discovered with making egg muffins in a muffin tin, is that the eggs can be messy. Unlike an egg bake where they go into a baking dish all in one go, getting the beaten eggs into the muffin pan wells cleanly can take a bit of finesse. The trick I have learned is to make the egg mixture, then run it through a fine mesh sieve (also known as a wire strainer.) This helps to break up the albumin in the egg proteins, and makes it easier to pour in just enough to fill up the muffin tin wells. I have a nice wide glass measuring cup that I strain it into, which works well because it has a little spout to pour the egg mixture out of. The sausage needs to be cooked before it is added to the muffin tins. If you are in a rush, buy precooked sausage or smoked sausage, and cut it into small chunks. To cook the sausage, remove the casings. To do that, just run the tip of a sharp knife along the length of the sausage and slide the casings off. Then crumble the sausage into a dry non-stick skillet. It will be kind of sticky, so don’t worry if the pieces are large at first. As you cook it over medium-high heat, you’ll be able to break it up into small pieces with a wooden spoon. There may be an excess of rendered fat in your skillet when you are done cooking. If you like, you can drain the cooked sausage on paper towels as you would for cooked bacon. The chopped broccoli also needs to be softened a bit before it goes into the egg muffins. I do that by quickly cooking it in the microwave. If you don’t have a microwave, you can do this step in a saucepan with or without a steamer basket. Here’s another shortcut: you can sub in chopped frozen broccoli. Just measure out 2 cups, then thawed and drain it. No need to cook it because the freezing and thawing will have softened it up enough. Coat the muffin tin really well with cooking spray. Or if you prefer to use another type of fat or oil to do so, that is fine. Egg muffins tend to stick to the muffin pans, so don’t be afraid to be generous with this step. 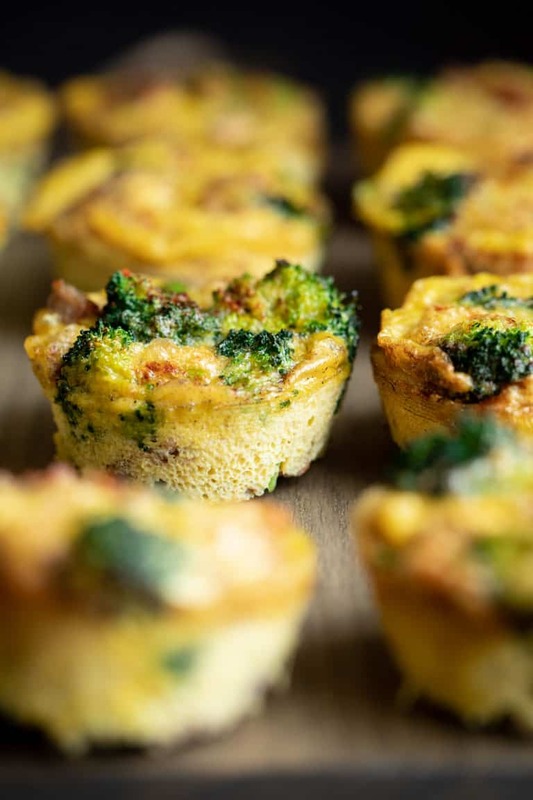 Layer the broccoli and sausage into the muffin tins. They will look quite full, but that’s okay, there is space around the pieces and the eggs will flow around them and fill in the gaps! Pour the eggs into each well of the muffin tins. This is where that spout comes in really handy! Lastly, sprinkle on the paprika. As I said this is not necessary technically, but I really like that pop of red it adds to the top of these egg cups. Omit it if you are in a rush. Carefully so as not to slosh the egg all over the muffin tin, transfer them to the center of the oven and let them bake. They cook through surprisingly fast (about 20 to 25 minutes is all it takes.) They will puff right up. Let them cool a little bit in the muffin tin, then run a knife along the edges to make it easier to get them out of the pan. Then just pry them out of the muffin pan with a butter knife. I keep them on a platter covered with a layer of parchment then a layer of plastic wrap or I put them into two large glass storage containers. I love these glass storage containers. (That’s an affiliate link.) They’re great for meal prep in general and the food doesn’t come in contact with plastic. To reheat them, put two egg cups on a microwave safe plate. Microwave on high for 1 minute until they’re steaming hot! If you prefer not to use a microwave, make sure to cover them when you reheat in the oven. Or you can always enjoy them cold. They are quite good that way! Please let me know if you make this recipe and come back and leave a star rating and review. It helps so much! 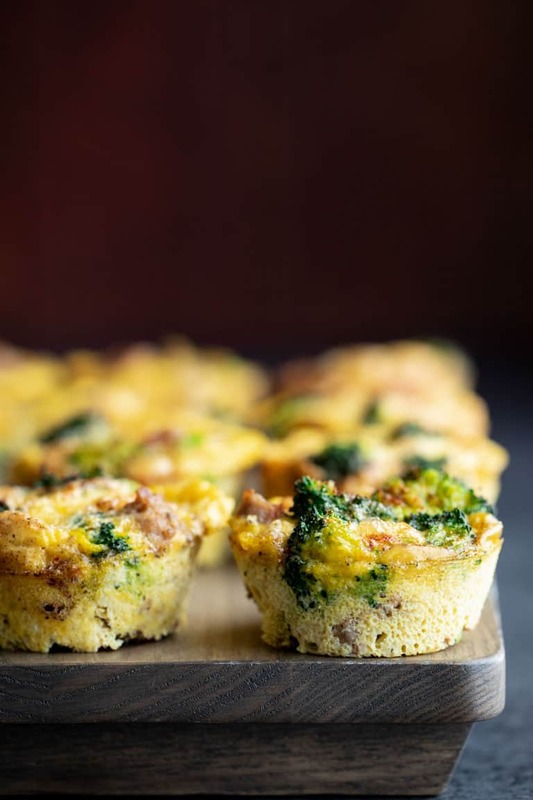 Paleo Egg Muffins with sausage and broccoli are an easy meal-prep recipe for a high-protein low-carb breakfast. 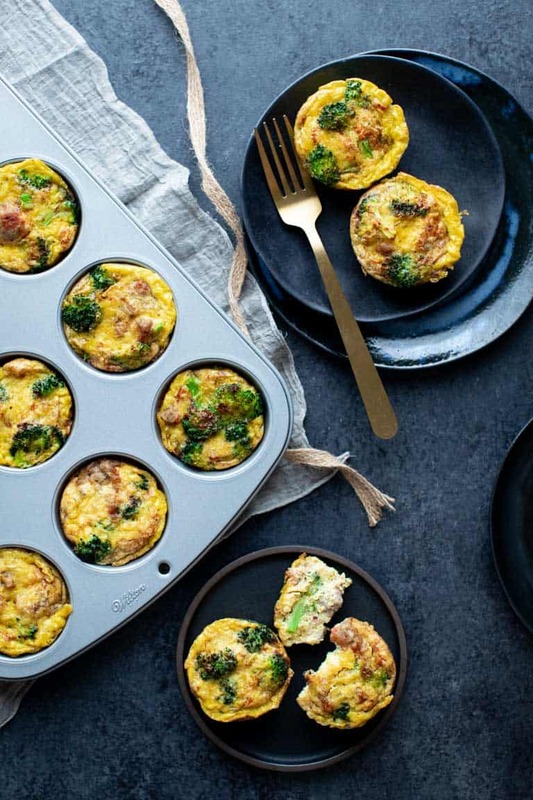 They’re like a mini omelet made in a muffin tin! Lightly coat a large non-stick skillet with cooking spray, set over medium-high heat and add sausage. Cook and crumble until the sausage is broken into small pieces, browned and cooked through. Meanwhile, preheat oven to 350 degrees F and coat a 12-cup muffin tray (generously) with cooking spray, oil or ghee. Combine eggs, mustard, salt and pepper in a large bowl and whisk well Pour egg mixture through a fine mesh sieve into a large measuring cup. Divide the sausage and vegetables evenly among the muffin tins. Pour the egg mixture over the sausage and veggies, dividing evenly. Sprinkle on paprika. Bake the egg muffins until puffed and cooked through, 20 to 23 minutes. Let cool in the muffin tins until warm. Run a knife along the edges of the pan, and remove the egg muffins. Feel free to sub in pre-cooked chicken sausage or smoked sausage. Just cut into small bite-sized chunks. Frozen chopped broccoli can be subbed for the fresh. Just measure out 2 cups frozen, then thaw and drain. No need to cook it. Thanks Anna. Don’t be down on yourself. Little steps make a big difference. I love egg muffins and these look fabulous. And I’m a big fan of cheese so I love how you added some flavors to punch this up without having to add cheese. I’ll definitely be giving the Dijon mustard a try. Hi Stephanie. I am glad you found that tip helpful. Enjoy! I always say I want to start eating breakfast more regularly, a make-ahead recipe like this would make it so much easier! Breakfast is so important. For me I find that eating a good breakfast really keeps me from over eating later in the day. Its funny how that works out. Hi Traci. I am so glad you like that trick too. It’s subtle but really helps the savory flavors come out. I love these muffins, and even my very picky daughter would eat them. Great to reheat in the morning for a quick and healthy breakfast. 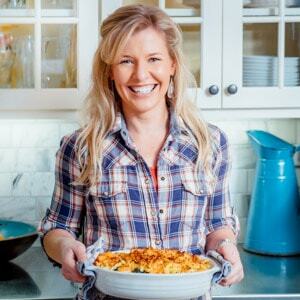 Thanks for a great recipe this is one of my new breakfast favorites! Hi Mary. Yay! So glad you made them. I am so happy you’re loving them as much as we are. I really appreciate that you came back to leave a star rating and review. That’s super helpful! We love egg, veggie, cheese (sometimes with meat) muffins. However, no matter how much cooking spray I used, I could hardly get my muffins tins clean. Now I use that wonderful invention – parchment muffin cups – in my tins. Stick no more! Hi Carolyn. They will keep for 5 days in the fridge. Reheat them until they are steaming hot. Enjoy!